Antelope Audio’s Digilink-compatible 32-channel AD/DA converter has become an industry-leader, achieving a phenomenal dynamic range of 136 dB in the Monitoring D/A converter. With upgraded conversion and refreshed design, the Orion32 HD Gen 3 will make your productions and live shows sound like nothing else on the market. Compatible with any DAW via HDX or USB 3.0, this new Pro Tools HD and Native-ready interface represents everything Antelope Audio stands for. 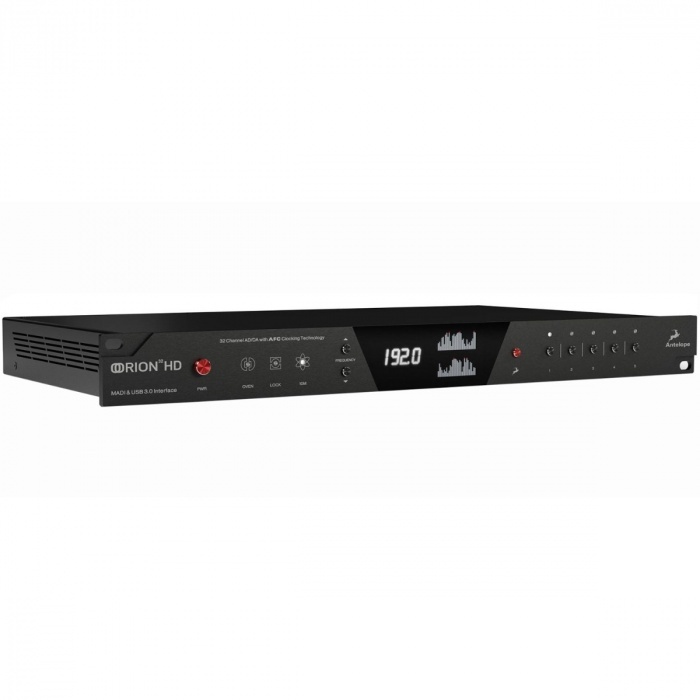 Zero-latency monitoring, streaming of 64-channel 24-bit/192 kHz audio, flawless clocking, pristine AD/DA conversion, extensive connectivity, and more. Smooth mixing and mastering-grade monitoring. Like its predecessors, Orion 32 HD Gen 3 is a versatile audio interface, which works like a charm with any DAW on the market. It enables you to not only stream an astounding 64 channels of audio when tracking, but also allows for multiple monitor mixes. When monitoring, the sound is pleasing, transparent, detailed and natural. Independent software mixers, integrated hardware-based FPGA vintage effects - it’s all there, with more connectivity options than ever. Perfect sound through flawless clocking. The unbeatable clocking accuracy of Orion 32 HD Gen 3 is provided by Antelope’s renowned 64-bit Acoustically Focused Clocking (AFC) jitter management technology. Antelope Audio clocking has over a decade-long reputation for excellence in both stability and sonic improvement. Transients will shine like never before and you’ll achieve a stereo image with incomparable depth and detail. And with that crystal clear high-end, we’re talking sonic perfection! Your wildest routing dreams come true with the Orion 32 HD Gen 3 desktop app. Orion 32 HD Gen 3 is fully controllable via its intuitive macOS and Windows-compatible desktop app. Its color-coded routing matrix now features an alternate view which makes routing a piece of cake. The interface can also be accessed from multiple computers on the same network. With freely movable and resizable panels, you can make the most out of your screen real estate - perfect when working on huge projects, scoring to picture, and on multi-screen setups.